NEW ORLEANS — There was an abundance of Southern hospitality and tradition as the second annual “class” of nominees was inducted into the National Sailing Hall of Fame at the second-oldest yacht club in the U.S.: Southern Yacht Club in New Orleans. From the opening notes played by the Marine Corps Band to the closing gun fired by master of ceremonies and 2011 Hall of Fame inductee Gary Jobson, the four living and five posthumously inducted sailors — including a Medal of Freedom recipient, the father of the yellow first-down line for televised football and several Olympians — were celebrated for their contributions to the sport of sailing. Many of the honorees credited perseverance as keys to their achievements — and the thread of overcoming adversity made the setting at Southern Yacht Club even more appropriate. After fire ravaged the club in the wake of Hurricane Katrina in 2005, Southern YC was seriously impacted when Hurricane Isaac struck last August — seven years to the day after Katrina had led to the club’s rebuilding. Although members were in the midst of cleaning up from this latest challenge, the club did not miss a step in planning and executing the second-ever National Sailing Hall of Fame induction. 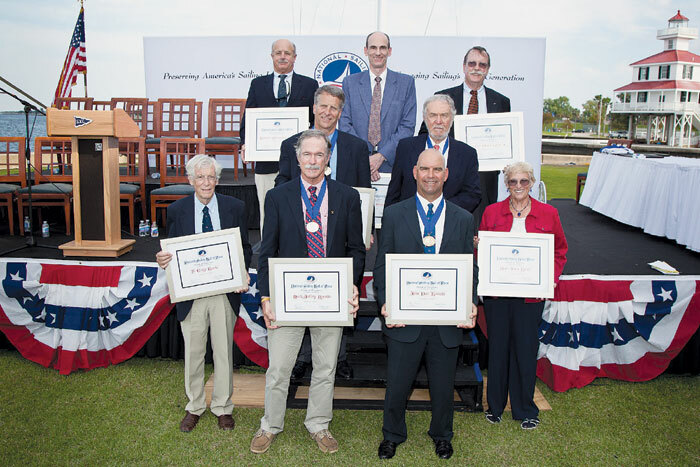 The National Sailing Hall of Fame inductees were picked following a two-month period this spring, during which sailors from all corners of the country nominated their choices for induction. The selection committee, which reviewed the nominations, was composed of representatives from US Sailing (the sport’s national governing body), sailing media, the sailing industry, community sailing organizations, a maritime museum, the National Sailing Hall of Fame’s founding yacht clubs and the 2011 class of inductees. The selected inductees are American citizens 45 and older who have made a significant impact on the growth and development of the sport in the U.S. in the categories of Sailing, Technical/Design and Contributor (coach, administrator, sailing media). Nominations of non-citizens were also considered if they influenced the sport in the U.S., and posthumous nominations were also accepted. The undertaking to recognize Americans who have made outstanding contributions to the sport of sailing is central to the mission of the National Sailing Hall of Fame, which was formed in 2005 and has completed Phase 1 of its plan to establish a permanent facility on the historic waterfront of Annapolis, Md. Stan Honey (Palo Alto): The 2006 Volvo Ocean Race winning navigator, aboard ABN Amro One, is recognized as one of the most outstanding offshore sailors worldwide. In 2010, he was presented US Sailing’s Rolex Yachtsman of the Year Award for the fastest circumnavigation of the globe, after the trimaran Groupama 3 — with Honey as navigator — set the benchmark of 48 days, 7 hours and 45 minutes (surpassed two years later in 2012), while eclipsing a record — by more than two days and eight hours — that had stood for five years. Later that year, Honey secured another record in the Newport-to-Bermuda Race as navigator aboard Speedboat. Honey’s accomplishments ashore are equally impressive. In 1998, Honey co-founded Sportvision Inc., which evolved to become the leading developer of live-tracking enhancements for sports television broadcasts. Honey led the development of the yellow first-down line for televised football; the NASCAR racecar tracking and highlighting system; the red and blue tails attached to streaking hockey pucks; and the baseball K-Zone system, which highlights the pitch location and strike zone in televised baseball. Honey currently works for the America’s Cup Event Authority on television technology. He has created the on-screen graphics that clarify the complexities of fleet and match racing in the America’s Cup World Series. He holds eight patents in navigational system design and 21 patents for television special effects. John Kostecki (San Anselmo): Kostecki began sailing at age 8 from Richmond Yacht Club on San Francisco Bay, and like many sailors, he credited his parents for being “very instrumental in my career in getting me going with sailing.” Kostecki has won the triple crown of sailing: a round the world race, the America’s Cup and an Olympic medal, which is something no other sailor in the world has achieved. “It’s pretty amazing. I’m still blown away with what I’ve achieved in the sport,” Kostecki said. He was quick to explain that his achievements were all on crewed boats. Kostecki started accruing national sailing championships at age 17 and won his first world title in the Sunfish class a year later. In 1988, he won both the world championship and an Olympic Silver medal in the Soling class. In 2002, he made international headlines when he skippered the yacht Illbruck to win the Volvo Ocean Race, after nine months of intense around-the-world racing that was punctuated by drastic weather and some of the closest racing in the history of the event. Now an 11-time world champion in a range of one-design classes, Kostecki’s leadership and sailing talents are supported by a tremendous depth of experience. A professional sailor and two-time Rolex Yachtsman of the Year (1988 and 2002), his tactical call aboard BMW Oracle Racing’s 110-foot trimaran in the second match of the 2010 America’s Cup (his fifth as tactician) propelled the team to victory. Recently, the 48-year old Kostecki helped win the 2011-2012 America’s Cup World Series, raced in 45-foot catamarans, as Oracle Team USA prepares for a defense of its America’s Cup title in 2013 on San Francisco Bay. Mark Reynolds (San Diego): Often called the “Star of the Star class,” Reynolds is a four-time Olympian who waged his first Olympic campaign in the Flying Dutchman class, only to be sidelined when the U.S. boycotted the 1980 Olympic Games. Switching to the Star class, his bid for a Gold medal at the 1988 Olympics — with crew Hal Haenel — was undone in the final race when a control line failed and the mast fell in the incredible winds and waves off Pusan, South Korea, leaving Reynolds and Haenel to settle for Silver. The first American Star sailors to ever repeat as Olympic representatives, the duo kept their focus for the 1992 Olympic Regatta in Barcelona and never finished worse than third in any race. Their consistency earned them the gold medal — and the luxury of sitting out the final race of the series. After winning the 1995 Star World Championships in Spain, Reynolds and Haenel made their third trip to the Olympics in 1996, finishing out of the medals. However, in 2000, the team won the United States’ first sailing Gold medal since 1992 — when Reynolds had last stood atop the podium with Haenel. “It’s a huge honor to be included today with all these great sailors — all of whom I’ve looked up to and, in some cases, sailed with and competed against,” Reynolds said. Bruce Kirby (Rowayton, Conn.): Kirby’s first career was a newspaperman in Ottawa and Montreal, However, the Canadian native is internationally best known as the designer of the Laser, which is sailed in Olympic competition. More than 250,000 of the one-design single-person boats have been built since the early 1970s. His designs also include the America’s Cup 12-Meter boats Canada I and Canada II, as well as the Ideal 18, San Juan 24 and the Sonar, which is raced in Paralympics competition. Kirby represented Canada at the Olympic Games three times: sailing a Finn in 1956 and 1964, and sailing a Star in 1968. “The reason why we really are all here is the overall long-term commitment and enjoyment to the sport of sailing,” Kirby, 84, told the crowd. Peter Barrett (Madison, Wis.; 1935-2000): The three-time sailing Olympian was well-known in international sailing circles for an act of sportsmanship at the 1960 Olympic Games in Naples, Italy, where he finished 11th in the Finn class after dropping out of a race in which he believed he had fouled another competitor. He would return to win a Silver medal in the Finn class at the 1964 Games in Tokyo, before switching to the Star class, in which he crewed for San Diego’s Lowell North to win Gold at the 1968 Games in Mexico. In his competitive sailing career, he won national and North American championship titles in a number of classes, and he was also a member of the crew on the winning boat in the 1971 Chicago-Mackinac Race. Professionally, Barrett served as a contributing editor to Yacht Racing/Cruising (now Sailing World) and he designed several popular sailboats, including the Aquarius 21 and 23 built by Coastal Recreation, and the Mega 30 built by C&C Yachts. When Lowell North started his sailmaking business, he recruited Barrett as his first salesman. Bob Bavier (New Rochelle, NY; 1918-2001): Sailing out of Larchmont Yacht Club, Bavier led his Williams College Sailing Team to intercollegiate titles in 1939 and 1940 on his way to becoming one of the top sailors on the East Coast. At the helm of Constellation, he won the America’s Cup in 1964. He embraced the sport professionally during a career at Yachting magazine that started with selling ads and then writing, before running the magazine as publisher. He authored seven books on yacht racing and took leadership roles in the national governing body of the sport as well as the international federation. F. Gregg Bemis (1900-1995): A lifelong resident of Massachusetts (Cohasset and Concord), Bemis is best known for his work on racing rules for the sport. His volunteer contributions include a long tenure as chairman of the national governing body’s Appeals Committee, as well as a leadership role in judging at junior and intercollegiate regattas. He was honored by the International Yacht Racing Union (now known as the International Sailing Federation), which awarded him the Beppe Croce Trophy in 1989. The prestigious award is for an individual who has made a voluntary outstanding contribution to the sport of yachting. A member of the Harvard class of 1922, Bemis was a national sailing champion who raced competitively into his 80s. John Cox Stevens (1785-1857): Stevens is best known as the founder and first commodore (1844) of New York Yacht Club. He was an integral member of the America syndicate, which won a yacht racing award in 1851 that is today revered as history’s oldest sporting trophy: the America’s Cup. Roderick “Rod” Stephens, Jr. (1909-1995): A native of New York City, Stephens launched his career in 1931 after collaborating with his brother, Olin, on the construction and fitting out of Dorade, which won the transatlantic race that year. A top skipper and tactician, he was in demand as a crewmember, and was a member of the team on Ranger, which won the America’s Cup in 1937. During World War II, he was instrumental in the development of the DUKW amphibious truck for the U.S. Army, for which he was awarded the Medal of Freedom, the highest civilian honor bestowed by the White House. Considered an expert in the design of rigging and fittings, he was highly regarded as a problem solver. He was associate designer and, later, president of Sparkman & Stephens, the yacht design firm founded in 1929 by his brother Olin Stephens and Drake Sparkman.